New York City Hits A New Population Mark, Topping 8.3 Million : The Two-Way New York City's population is at an all-time high, with an estimated 8,336,697 people living in the city, according to the most recent U.S. Census Data. "For the first time since before 1950, more people are coming to New York City than leaving," said Mayor Bloomberg. For the first time in six decades, New York City has added more residents than it lost, according to the most recent Census data. 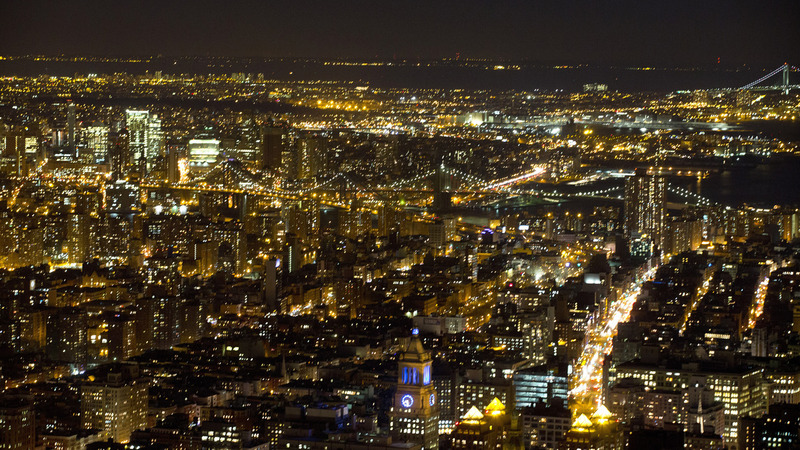 Here, lower Manhattan and Brooklyn are seen in a photo taken in February. New York City's population is at an all-time high, with an estimated 8,336,697 people living in the city, according to the most recent U.S. Census Data. "For the first time since before 1950, more people are coming to New York City than leaving," said Mayor Bloomberg, announcing the gains Thursday. Announcing the growth Thursday, Mayor Bloomberg gave credit to low crime rates and high life expectancy and graduation rates, as well as job prospects that draw new arrivals. "New York City's the magnet," Bloomberg said in a Newscast report filed by NPR's Jamie McIntyre. "People want to come here." The Census Bureau says its data from on July 1, 2012, shows New York remaining the nation's most populous metro area, with an estimated 19.8 million residents, followed by Los Angeles and Chicago. "All in all, nine metro areas had populations of 5 million people or more, while 52 had at least 1 million," according to the Census website. Citing Brookings Institution demographer William H. Frey, The New York Times reports that the New York region "drew 123,000 foreign immigrants since 2011, more than metropolitan Los Angeles and Miami combined." Mayor Bloomberg's Department of City Planning notes that while the 2010 numbers may have been artificially low due to reporting problems, those issues did not affect the 2012 findings.